. On 27.7.17, Rahu and Ketu will be entering the Cancer-Capricorn axis and will stay there till 13.2. 2019. Rahu-Ketu Transit 2017 – Major Breakthroughs to Take Place? After planet Saturn, Rahu and Ketu take the longest time to complete their transit in one Sign. Thus, both these shadowy malefic planets have an extremely significant impact on our life trends. Both these planets are the representatives of our Karma and deliver results exactly as per our deeds; while Rahu signifies our future, Ketu denotes our past. When planets as important as these change Signs, major transformations take place in the world as well as in various areas of our life. When both these planets are operating, change will take place when you least expect it. Opportunities will come, when you are least prepared for them. All this enables us to go ahead and act on the basis of our instincts and to act immediately. When all the other planets are moving in the clockwise direction Ragu and Ketu move in the opposite direction i.e. from Meena Rasi to Kumba Rasi and thereon, while other planets move from Mesha Rasi to Rishapa Rasi. . That is why; Ragu and Ketu are called as retrograde planets. During this transit, Ragu transits to Kadaga Rasi and Ketu transits to Kumba Rasi measures are performed according to Vakkiya Panchangam only. These two snake-planets are not having their own Houses and Rasis. 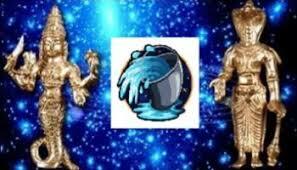 They give the effects of the Lords of the House in which they stand and the planets which are standing along with them. For example, if the planets Ragu and Ketu stand in Meena Rasi they give the effects of Jupiter and if they transit in Kumba Rasi, they give the effects of Saturn. Both of them aspect 3, 7 and 11th houses from the house at which they transit. As remedial measures, you can visit the temples at Sri Kalahasthi, Thirunhahesvaram, and Mannarsala nearby Kizperumpallam and perform poojas. You can also go round ‘Girivalam’ in Thiruneermalai, Thiruvannamalai, Kumarankunram and ParvathaMalai. Perform Archanas for Ragu on Saturdays and for Ketu on Tuesdays. You can also light lemon-lamps and worship with lemon rice during ‘Ragukalam’. Now we will see the predictions of the transit of Ragu and Ketu. On 27.7.17, Rahu and Ketu will be entering the Cancer-Capricorn axis and will stay there till 13.2. 2019. Ragu transits in your 4th house. Ketu transits in your 10th house you cannot expect favorable effects, due to these transits. Now we will see the effects of the transit of Ragu and Ketu. Ragu transits in your 4th house. Your mother’s health will be affected. You will have to face loss by your vehicles and cattle. If you are constructing a house, the works will be affected and you cannot finish of the construction work successfully due to the shortage of finance or by the troubles created by your enemies. Some of you may vacate your house and shift to some other house. Some will sell their own house and shift to a rented house. You will have to undergo outstation- trips, by which you will be tired and your health will be affected. Some of you cannot get stationed jobs and will get jobs of wandering from place to place. You cannot fulfill the requirements of your family members and your family will face quarrels and confusions. There will not be unity among the family members and there will be hatred and mental worries among them. There is also a danger of poisonous –bites. Students will not have concentration in their studies. They can qualify in the examinations only out of hard work. They have to change their place either for study-purpose or for job opportunities. The elders in your family will fall in ill. You have to incur medical expenditures. Instead of spending for important expenditures, you will spend for amusements and feasts. So, you may have to borrow money for the unavoidable expenditures and you may also have to suffer for want of money. Businessmen may have to suffer by taking wrong decisions and they may have to incur loss in the business. Those who are working in the offices will have overwork. They will not have a nice time with their higher authorities and colleagues. They will be transferred to undesired places. Some will be placed in Positions which are lower in status. During this transit, there may be theft in the houses of those whose ‘Dhasabukthi’ is not favorable. Those who are waiting for foreign jobs will get it. Some will go on foreign tours. Some will involve themselves in social service. They will get permanent properties in future and the transit of Ragu will help for that. As Ragu aspects your 6th house, your enemies will be weakened. Some will be able to pay back their old loans. But they may also have new loans. You will have the troubles of small ailments like Allergy, and skin deceases, though you may be relieved of from the major deceases. As Ragu aspects your 2nd house, your domestic happiness will be disturbed. You will not have adequate money for your domestic expenditures. Your family will be having a lot of confusion. Your talk with others will also create problems and enmity. Ketu, by his transitin your 10th house, will give setbacks in your business. Your business will not improve. There will not be adequate money-flow in your hands. Some will give up their business. Those who are working in the offices will think of going on voluntary retirement. Your honesty and social status will be affected in the financial matters. Some will face problems by misusing their powers. Thus the transit of Ragu and Ketu may not be favorable. But you need not be scared of it, because the transit of Jupiter will be supportive to you giving favorable effects. Ragu’s transit in your 3rd house will give you moral courage. You will become bold while facing problems. Your mind will always be cheerful. You will always be active. You will be brave in fulfilling all kinds of turbulent efforts. Your face will shine. Even those who are against you will be ready to help you. You will undergo outstation tours very often and all the travels will be beneficial and will help for the upliftment of your life. Some will get sudden income unexpectedly. Your financial status will rise up. Your business will flourish. You will get the expected profit. Your talk will have its value. Your social status will rise up. Some will get higher position in the society and honorary posts. Some will get new friends. They will be helpful. You will get yourself introduced to politicians and higher Govt. officers. Such introduction will help for the improvement of your life. You will win in all the competitions, races and the stock market. Those who are trying to get jobs abroad will get it. Some will succeed in enlarging their business in foreign countries. Friends and relatives living in foreign countries will help you. The foreign connections will give you income as well as respect. Those who are working in the offices will get transfers to the desired places. Some will get promotions and some will get powerful postings with higher responsibilities. Those who are having favorable Dhasa Bukthi will get more benefits during this period. You can enjoy by attending feasts, parties and jolly-gatherings. You will develop your interest in arts, music, literature etc.. Students will concentrate on their studies and score high marks in the examinations. Cinema artists will get new chances and will enter into new contracts. Their talent will be known to all and they will get tributes and awards. Your mental courage will increase. Your brothers and sisters will improve and they will be helpful. Brothers and sisters who departed you will come back now. You will buy new vehicles and all kinds of facilities in life. Your financial position will improve. You will purchase new properties, new ornaments and new dresses. Some will get profit by selling your properties which were purchased long back and the prices of which are increased double or triple times. Problems persisting in your ancestral properties will go away and you will get back them without any trouble. Your plans which met setbacks so far will be finalized now. Ragu aspects your 11th house. Due to this, your children will improve. They will shine in their studies. You can worship your family-deity. Childless couple will get a child. Ancestral properties will bring profits. Ragu also aspects your Rasi. Your face will shine with happiness. Your mental happiness will increase and all your worries will go away. You will get back your things lost by you. You can command respect from others. Now, we will see the effects by the transit of Ketu in your 9th house. Your lifestyle will now change in a meaningful way. You will have a purpose in anything and everything. Your life will cross over a successful journey. You will become pious and develop spiritual interests. You will be stubborn in doing only noble deeds. You will be an ideal person. Your father’s health and the health of the elders in the family will give some problems. Your plan to worship your desired God and the family Deity will now be fulfilled. Some will get a higher post in the temples. You will also get higher responsibilities. You will have noble thoughts in your mind for protecting justice and honesty. Some will get the friendship of new persons. Your talent which was not known to others will now be known to all. Chances will come to you to utilize your intelligence. You will aspire more for your name and fame than for money. You will be keen in getting respect and become popular among the people. Though you get more facilities in your life, you will avail them with a limit. Some will leave the family on account of foreign job or your business abroad. Ketu aspects your 11th house. You will get profit in your business and you will get unexpected income. Your brothers will find a tough time. You will have medical expenditures. Ketu aspects your 7th house also. The health of your spouse may be affected and her mental peace may also be affected. You may get some help from the relatives of your spouse. You will get new friends and they will help you. You will also get new partnership business. You will get income from the sources which you did not expect. The health of your parents may be affected and you have to incur medical expenditures. You will get the support of your higher authorities and your colleagues. Some will get promotions and increase in the salary. Quite unexpectedly, some will get the properties of their relatives. You will have cordial relationship with your spouse. From 27.7.17 onwards, Ragu transits to your 2nd house –Kadaga and Ketu transits to your 8th house Maharam. Though this is not a favorable position, the transit of Saturn in the Thula Rasi is also favorable to you, because Saturn is the Lord of the Trine house for Thula Rasi. 2nd house is meant for your speech, wealth, talent and family affairs. All these things will not only minimize the evil effects of Ragu and Ketu, but also give the required money-flow for meeting your requirements, and also boldness for achieving anything and everything in your life. So, we will see the effects of Ragu and Ketu, taking into account of the effects of Saturn. Ragu, in your 2nd house will make you to work more for your family. Your domestic responsibilities will increase. Conducting of family will become a burden to you. During this time you should talk very carefully to others. Out of your tension, you may use hard words to your family members. Because of this, you may have misunderstandings with your spouse. You should hence, be careful in your talk with others. Your income level will go down. So, you may hesitate to undertake any expenditure. There may be delay in getting the expected money from any source. Due to shortage of finance, you may not be able to fulfill even the essential requirements of your family members. Thus you will be at the receiving end for the anger and hatred of your family members. Though you may get sudden unexpected income, expenditures will be waiting to swallow them and you cannot save money .During this time, you cannot conduct your life in the path of honesty and you may have to lead a false life, telling lies. You will always be in the search of money. As you may not get the financial support, some will attempt to earn money by adopting short-cut methods. Due to this, your dignity, social status and your popularity will get damaged. You cannot maintain honesty in your dealings. You may have to face setbacks in all the financial matters. You have to take care of your health, especially your eyes. Your children may suffer and they have to struggle a lot, for safeguarding their education and job opportunities. After strenuous efforts, they can shine in their studies and get suitable jobs. Some will have to undergo travels very often. You may not get the expected monetary benefits by all the travels .Unnecessary misunderstandings and conflicts with your spouse cannot be avoided. So, you should always handle matters in a defensive way of avoiding the difference of opinions by extending a patient hearing to your spouse and adopting a give-and –take policy. If you fail to follow these measures, problems may aggravate and you may have to be away from your family temporarily. Those who are in Govt. job or working as an administrative officer should be careful now. Some may have the chances to be punished for getting bribe and even to be arrested. Marriage proposals may meet setbacks. But the transit of Jupiter in your 9th house may change this. You may not succeed in all your efforts and get tension out of these failures. Don’t give promises to anybody, because you cannot fulfill them. Don’t stand surety for anybody. Chances are there for unnecessary problems and troubles, which will be on the increase. In spite of all the setbacks in your life, you will think of the welfare of others. Some will have the chance of buying lands. Some will have the chance of starting new business and enter into new contracts. You will also be able to conduct a marriage in your family out of so much of efforts. As Ragu aspects your 4th house, you have to take care of your mother’s health. You may have misunderstandings with the relatives of your mother’s side. The construction works started by you cannot be completed. Your vehicles will give you repair-expenditures. You may have some health troubles. Ragu also aspects your 12th house. By this aspect, you may have to spend money in the waste expenditures and unnecessary wanderings. You may spend sleepless nights. Doors may not open for your income but doors may open for expenditures. Your mind will aspire for giving donations to the needy. You can be safe only if you concentrate on spiritual matters. Now, we will see the effects arising out of the transit Ketu. You should be careful while traveling, as carelessness may create troubles. You should not go into the affairs of others, because their problems may drag you in trouble. You will be getting some sad news and your mind will always be filled with worries. You will have to face loss of money, enmity and unnecessary conflicts with others. Unexpectedly, you will get sudden incidents of sorrows and mental worries. Some may also face life-threats. Readers need not worry because the effects will come based on your present Dhasa-Bukthis. You can also minimize the adverse effects by doing suitable ‘parikaarams’ and remedial measures. During this time, you may have financial problems. Some will get monetary income unexpectedly or by selling their ancestral properties. This is not a good time for doing partnership business, as you may have to lose even the money on hand. At this time, if you entrust your money to anybody, you cannot get it back. Ketu aspects your 10th house and create troubles in your business. Aged persons may be affected more. Those who are working in the offices will have overwork. Your higher authorities and your colleagues will not support you. The office atmosphere will give you mental worries. Ketu aspects your 6th house. You will repay your old loans. Your enemies so far troubling you will get automatically involved themselves in trouble. You will have allergy and skin deceases. You may get poisonous-bites. Your maternal uncle will suffer. You will have problems by women. Your name will be spoiled. You will have misunderstanding with your spouse and her relatives. You will not have peace of mind in your business and you cannot get profit. Your prayers only will give relief to you. Once again, you are reminded of the favorable transit s of Jupiter and Saturn, which may minimize your troubles to a greater extent. On 27.7.17, Ragu transits to your Jenma Rasi and Ketu transits to your 7th Rasi . These transits are not considered to be good. You will be wandering without knowing the purpose of wandering. You will have to undergo travels very often but they will not be beneficial to you. The will make you tired. Your health may be affected. Some will be suffering from an unknown disease which cannot be diagnosed as to what disease makes you suffer. During this time your education will not help you to overcome your difficulties. Your talent will not be useful for solving your problems. Your mind will be with total confusion. You will get tension out of the incidents happening around you. You may not be able to take a decision for all the problems. Your income will be reduced. Your business will be in an average status. There will be medical expenditures as well as waste expenditures. During this period, you should be careful with the people of other religion because you may get troubles from them. Try to avoid them by clever tactics. Otherwise you will lose your money and time. During this period, you can continue in the present stage itself without taking any new efforts. New ventures will bring loss. If you start new business with a small amount of money on hand, you will not be able neither to continue it nor to give it up and entangle yourself in problems and fall in worries. Some of you will shift your residence to a new place. You will also have to shift your business organizations to new places. Those who are working in the offices will find a tough time. Workload will increase. You will not have peace of mind. Your colleagues will not cooperate with you. Your higher authorities will find fault with you and also allot extra works to you and make you restless. If you represent your difficulties, your grievances will not be redressed; instead you will be penalized and transferred to far-off places or your job will be changed and the transfers and changes will be sudden causing so much of dislocation to you. Disappointed by the failures, you will divert your path to short-cut methods. But your short-cut methods will increase your troubles and you will be humiliated. For escaping from these troubles, you will continue the same short-cut ways. Finally, you will become unpopular among your competitors. Your health will trouble you. Fever and indigestion problems may come to you. Pregnant women should be so careful. Ragu aspects your 3rd and the 7th houses. By these aspects, your relationship with your brothers and sisters will be affected. You will have misunderstanding with your spouse. Some will have to lose their job. Newly married couple will not be happy. You will have misunderstandings with your spouse. Unexpected problems will come. Your enemies will work against you and stab at your back. During this period, you should move with anybody only after finding out whether he is good or bad so that you can be relieved of the troubles in future which may come to you from them. Ragu’s transit in your ‘Janma Rasi’ will cause drawbacks in your business ,very bad name in your office, unwanted quarrels with your relatives ,wasting your efforts, creating bad opinion about you in the minds of your higher authorities and so on. You will have hurdles even in small works. You will undergo aimless travels. One of your family members will fall in death-bed. Some of you may face sorrowful events in their families. Now we will see the effects of Ketu .Ketu transits in your 7th house. By this transit the health of your spouse will be affected. You should move carefully with your friends. Otherwise your friendship will change into enmity. If you do not adjust with your business partners, your partnership business will be affected. Chances are there for you to be cheated by your business partners. Your mind will be with confusions and restlessness. You may not be in a position to arrive at a decision. Some of you will be penalized by your action of indulging in unlawful activities. Your mother’s health may be affected. Politicians will be suspected and criticized by your boss and your followers. You will have to undergo long travels which may not be useful to you. Ragu transits to your 12th house and Ketu transits to your 6th house. Now we will see the effects of this transit. Ragu’s transit in your 12th house will give you so much of wanderings and travels. Thus you will have more workload. You will not have good sleep at nights. Some of you may have to stay in outstations, due to your job or business. Problems will arise in your ancestral properties and they will be solved later due to the pacification of some middlemen. You will have to spend for your children and grandchildren. During this time, you will have to bear unwanted expenditures coming from the politicians and Govt. officers. Your mental worries will increase. . You will have troubles by the enemies behind you; but they will not be able to do anything against you. Some of you will have foreign jobs. You may not have deep sleep at nights. Women should control their expenditures; otherwise they will have to face financial shortage and problems relating to money. During this period, you will not get wages equivalent to your labor. You will have to work more when compared to the wages. As Jupiter aspects your 12th house, Ragu, who transits in the 12th house will cause good expenditures for an auspicious function. During this period, Ragu aspects your 10th house and cause some setbacks in your business and careers. Manufactured products cannot be marketed. Small merchants who bought your things on loan basis will not repay. Thus you will be in need of finance. Ragu aspects your 2nd house and you cannot maintain your honesty. Apart from this, your stats and dignity will be affected. Problems will come in your family every now and then. You cannot get income for the expenditures of your family. Further you will speak very angrily to others. You may have eye troubles also. You may have to lose your name and fame. You will have to bear with the anger and hatred of your higher authorities. You will not have a cordial relationship with your spouse. Some major damages may come in the family, if you don’t maintain patience. The attitude of your children will give you worries. Now we will see the effects of the transit of Ketu. Ketu transits in your 6th house purposely with a view to drive away the evil effects arising out of the transit of Ragu. Chances are bright for escaping from the unfavorable transit of Ragu. Ketu will give you progress in your business .All your enemies who were giving you competition and troubles will run away from you. Some of you will repay the old loans. At the same time, you can get fresh loans for improving your business. You can get increase in your income. You can also get unexpected sudden income. Some of you will get profit by selling a different kind of product. Deceases so far troubling you and your family will get cured and the health of you and your family members will improve. You need not have to incur medical expenditures any more. Your status and dignity will grow. Your dealings of monetary tractions will be successful, as you are getting adequate money flow on hand. You can maintain your honesty, on any account. Your intelligence will bring success in all your efforts and in all your activities. Those who are in the public life like politicians and media persons will improve. Those who are working in televisions and the film stars will earn very good name and fame. They will get new contracts. They will have new postings and honors. Those who are doing social service will become famous. Marriage –proposals which have been delayed so far will now be materialized. Politicians will become popular. As, Ketu aspects your 8th house, the hidden problems so far troubling you will come out and get solved. Workload will increase for you and you will also get income in the increased quantum. Your mother’s health will improve. You will also get the help of the relatives on your mother’s side. You will get chance to construct a house. Some will get new dresses and ornaments. Thus, Ketu’s transit in your 6th house will give wonderful benefits to you. You will have mental courage. You will be very active and win in all the matters with your intelligence. Your business will bring the expected profit. Your enemies will disappear. Your friends will help. You will have success in the court cases. Your higher authorities will support you in the work places. All your efforts will succeed and bring benefits. Your relatives and friends will come to your help. Relationship with your spouse will be very good. Your children will reach the heights in their education and job opportunities .You will be proud of their glories and hey will be helpful to you. Your family will witness happy events. Ragu will transit in your 11th house and Ketu will transit in your 5th house. Now we will see the effects of these transits. Ragu’s transit in your 11th house will give favorable benefits to you. So, you need not worry about this. You will get all kinds of favorable effects in the unexpected ways. Some of you will get Govt. jobs. Some of you will get the expected help from the Govt. Some of you can continue your studies by getting study loans from the Govt. People of other states and other religions will help you. You will buy new dresses and new jewels. You will be relieved of from the burden of loans because you are getting increased income. Your elder brothers will be prosperous and they will be helpful to you. Some of you will purchase properties, new vehicles, lands and houses. Those who were suffering from the troubles of court cases will now be relieved of them. If judgments are likely to be pronounced, it will be in your favor. Ragu in your 11th house will aspect your Rasi by his 3rd aspect. By this aspect your mind will be full of happiness. You will be very active. Your face will glow with proud and pleasure. Your mental courage will increase. You will finalize all the efforts taken by you successfully. Your 9th house also gets the aspect of Ragu.Your father will be prosperous. You will be benefited by the relatives of your father. You will get the fortune of enjoying all kinds of favors. Marriage proposals will materialize now. You will get yourself introduced with a VIP. You will also get honorable postings by him. . You will get new friends and they will come to your rescue when situation warrants. You will have the chances of participating in the feasts and recreations. You will get the support of your higher officers and colleagues in your work places. You will get progress in your business and mental satisfaction. You will get victories in all fields. Relationship with your spouse will be cordial. You will get good news during this period. Now we will see the effects of the transit of Ketu. Ketu transits in your 5th house. You will have to worry about your children. They are likely to marry the people of other religion. You have to spend for them excessively. Those who are using Drugs should stop the habit immediately because you cannot at all come out of it. If you are a pious person, you will go deep in those thoughts. During this time, you will meet the Saints and Holy persons and get their blessings. Problems will arise in the ancestral properties and you cannot avoid quarrels. Though Ragu transits in the 11th house, Ketu will hinder the ways of getting money by race, lottery and gambling, by the transit of Ketu in the 5th house. Thus you can get less income by way of gambling, and races. If you aim at the less profit, chances may arise for you to lose even the money on your hand. So, it is better to avoid the ways of gambling. You should also avoid taking Drugs to safeguard your health. Your dealings with the Govt. will meet hurdles and nothing can come to a final settlement at the right time. At this tine your mind will indulge in back magic and you will involve yourself in it. Students will lose their concentration in studies. Some of them will entangle themselves in love-affairs, not only wasting their time but also will fall in worries due to love-failures. Pregnant women will not find a nice time due to the transit of Ketu in your 5th house. So, care is essential wherever it is required. Some of you may face partition of properties in their families and you can get your due share. Your 7th house will have the aspect by Ketu, and by this, the health of your spouse may be affected. If your spouse is a pregnant woman some special care is required, because pregnant women are likely to cross a tough period. You should avoid interfering in the matters of the relatives of your wife. You can get some new friends by whom you can be benefited. Some will get new partners and new partnership- business. Ketu aspects your 3rd house also and by this, your mental courage will increase. You will become bold so as to complete difficult tasks. You will be able to solve all the problems, however difficult they may be. Your younger brothers will improve and they will be helpful to you. You will worship your family-deity. Ragu transits to Kadaga Rasi and Ketu transits to Mahara Rasi on27.7.2017. Ragu transits to your 10th house and Ketu transits to your 4th house. Now we will see the effects of the transit of Ragu and Ketu. The transit of Ragu in your 10th house will not be favorable to you. There will be changes in your business some of you will give up your old business and start a new business. Some will introduce new techniques and new skills, to set right the defects and the loss in the business. They will try their level best to give a face-lift to their business. Some will have to move from one place to the other on account of their business. Whatever may be the new techniques you introduce in your business you cannot expect growth in the business. Those who were not having a business of their own will now start a new business. Some will construct buildings for starting a new business. You may have to go on outstation tours on account of your business very often. By this, you will have to suffer from tiredness, loss of good sleep and timely food. Some of you will get loans for promoting their business. Some of you will get sudden income unexpectedly. However there will be reduction in the income. There will be financial problems continuously. There will be interference of third persons in all your efforts. This will give you annoyance and mental worries. In spite of your hard work applying your intelligence, you cannot expect growth which may commensurate with your hard work. You will have enmity and difference of opinions with your brothers. You will have unnecessary arguments and quarrels with your younger brothers. You will have unnecessary expenditures and troubles with regard to your house and lands. Those who are dealing with the business of chemical products, fertilizers, real estate and medicines will have a tough time. Those who are dealing with fake medicines will be imprisoned. Your mental courage will come down. You will be afraid of the problems standing before you. . Old-age person in your family will fall in sick bed. You may witness a sorrowful incident in your family. Ragu aspects your 3rd and the 12th house. By these aspects, you may face unnecessary quarrels with others. Some will have to wander here and there for the court cases. You may have disagreements with those in your business organizations and meet problems there. Those who are working in the Govt. offices will be transferred to other places and they will have their jobs also changed. Chances are there for your higher authorities to give you troubles and problems, without having proper understanding on you. You may not get favorable judgments in your court cases, now. Unnecessary expenditures will increase. You will have sleepless nights. Your travels will increase but you cannot be benefited out of them. You may get new friends and they will be helpful to you. Some of your relatives will help you. You will have gradual income in your business. Relationship with your spouse will be good. Now we will see the effects of the transit of Ketu in your 4th house. This transit may not be favorable. Your mother’s health may be affected. You may have misunderstandings and enmity with your mother and the relatives of your mother. Some of you may become responsible for the anger and curse of the Saints and the Holy men. If you show your anger and impatience with your family members, there may be confusions and quarrels in your family. Your business will have a setback. One of your laborers who worked in your organization will start a business and give a tight competition to you. This will affect your business very badly. Your health may be affected and you may incur medical expenses. You will have difference of opinions with your relatives and misunderstandings with your family members. Those who do not maintain patience may have to leave their family. You have to adjust with your neighbors. Otherwise you will have to quarrel daily with them. You will have unnecessary expenditures for your vehicles. The construction works of some of you may come to a halt. You may have to meet unnecessary expenditures and loss in the matters of your house and lands. Agriculturists will meet with loss with the cattle. Some will lose their properties and shift to other towns. Some will become slaves to bad habits. Ketu aspects your 6th and 2nd houses. By this, your status will come down. You will have financial setbacks. Your angry words will invite troubles .you will not be patient. You may have to struggle to maintain your honesty. Some will have the troubles of loans. Your enemies will also give troubles to you. The health of your parents may be affected. Medical expenditures will increase. Unnecessary expenditures will increase. Progress will be affected. You will face decrease in income, unnecessary wanderings, bad name, and financial shortage. Your status may go down. Loans will give you mental worries. You will also fall in worries about your family. You will have good relationship with your spouse. On 27.7.17, Ragu transits to Kadaga Rasi and Ketu transits to Mahara Rasi. Thus Ragu transits to your 9th house and Ketu transits to your 3rd house we will see the prospects of these transits. Ragu’s 9th house transit gives you favorable benefits. Your father’s health will improve. You will get benefits from your father and the relatives of father’s side. Your business will improve. You have to undergo travels for your business. Those who are awaiting jobs abroad will get it. Some of you will have business contacts with the trade centre of foreign countries and improve their business in the foreign countries. People of other religion, other countries and other languages will be helpful to you. Those who are having dealings in foreign trade, producing different kinds of products, and electronic goods will move to a higher position. Businessmen dealing in Import- Export business will get more profit. Your spiritual thoughts will increase. Your interests in the Vedic and mythological matters will develop. In the temples and in the Vedic Schools, you will get honorable posts. You will get the Dharshans of Sadhus and Saints and get you will be honored by them. Some will go on pilgrimage tours. Your ancestral properties will fetch profits. During this period even your enemies will help you. Those who differ from you will also come near you after seeing your talented activities. Those who are working in the offices will have less workload. Some of you will get the chance of getting increase in the salary and promotions. Your higher authorities and your colleagues will support you and will help you. Ragu aspects your 11th house. By this, you can get more profit in your business than what you expect. Your elder brothers will improve and they will be helpful to you. You will succeed in all your efforts by using your intelligence and you can get more income. Ragu aspects your 7th house. Your spouse will get rid of the disturbing deceases and they will have good health .You will be benefited by your spouse and the relatives of your spouse. Some of you will get new friends and they will help you. You may get new partnership business and your partners will be helpful. You will also help your friends and you will eliminate their sufferings. You will get good income and more responsibilities. By this, your workload and official –travels will increase. You will be happy with the progress of your children. Relationship with your spouse will be good. Ketu transits in your 3rd house and He will give all favorable benefits. All important and necessary domestic things will come to your house. You will meet the Saints and get their blessings. You will get powerful posts. Your business will improve. By this you will have adequate money-flow. Some of you will go on pilgrimage tours. Your mental courage will increase. You will handle any problem and have the courage of handling them successfully. Avoid having friendship with the widows. Otherwise you will get troubles by them. Your heroic deeds and boldness will be applauded by all. You will get unexpected sudden income. This is a period in which you can get benefit even without a bit of effort. Each and every step will give you benefit. Some will involve in the spiritual matters and become famous out of it. But if you misuse your good name, you will become unpopular. Some will buy houses and lands. They will also buy new dresses and ornaments. Ketu aspects your 5th house. By this, problems prevailing in your ancestral properties will go. You will get profit in your ancestral properties. Your children will improve. Some of you will conduct marriages for their children. Your children will get jobs. They will improve their higher studies. You will worship your Family – Deity. Ketu also aspects your Rasi. By this, you will improve your mental courage. In all your activities, you will get confusion at first and it will disappear later. You will expose yourself as an action-king. Ketu’s transit in your 3rd house is the beginning of a good fortune. All your worries, sufferings and poverty will go away. Deceases will go away and your health will improve. Medical expenses will decrease. You will get money from all the sides. But you will have more expenditure. So, you should be extra careful. If you are careful in the financial matters, you will attain a higher status in life. Friends, and your well wishers will be helpful by giving timely advises to you. Relationship between the husband and wife will be good. On 27.7.17, Ragu transits in Kdaga Rasi and Ketu transits in Mahara Rasi. By this transit, Ragu transits in your 8th house and Ketu transits in your 2nd house. Now we will see the effects of these transits. Ragu in your 8th house will cause unexpected incidents. The incidents need not necessarily be sorrowful incidents. They will also be happy with some unexpected turning points in life. Ragu aspects your 10th house. By this, you will have to travel to other places in view of your business or your job. Some of you will change their dwelling places very often. Some of you will shift their residence to new houses. Some will get the chance of getting unexpected properties. Some will get unexpected profit in speculations. But it may not be good to depend on those profits. Ragu will cause some unexpected incidents during travels. So, you have to be extra careful during travels. Avoid unlawful deeds, because you have to face police and court cases and punishments. Likewise, you are likely to face problems from the Income Tax authorities, if you are not maintaining your accounts matters correctly. You may lose your articles by way of thefts during travels. Those who are working in the Govt. offices may be caught in trouble, if you try to get bribes and you cannot avoid police-arrest. You may not get the support of your higher authorities. Those who are waiting for jobs abroad will get it. Some will undergo foreign trips. Those who stood as surety for others will have troubles. You may also lose your honesty, if you do not manage your income and expenditure levels properly. You will meet trouble, if you try to get things done in the search of a job, with the help of money. You will be cheated by others with whom you entrusted money for getting things done. Normally, you may face troubles of waste of money, aimless wanderings, troubles from the enemies, friendship with bad elements and defamation by women. Now we will see the effects of the transit of Ketu. This is not a favorable period. You may face setbacks in financial matters. Your business will be dull. Your income will go down. You may not handle the financial matters successfully. You may struggle even to meet your daily domestic necessities. Though you get some income, expenses will be coming rushing behind and all your money on hand will go away. You will have enormous expenditures. You have to run after money for meeting the expenditures. So, you should try to wisely plan your expenditures. Students cannot shine in their studies. Their attention will get diverted. You have to struggle hard to get good marks in the examinations. Quarrels, misunderstandings and confusions will prevail in your family. You will enter into unwanted arguments with the family members and invite troubles. Due to want of money, you will not be in a position to fulfill even the justified expenses of your family members. Because of this, your family members will not be happy with you. The health of your spouse will be affected. Your health also may be affected. Unable to withstand the problems arising in the joint family, some will leave the house and opt for separate families. You cannot stand by your words and you cannot keep up your promises. Your social status will go down. Some of you will be disappointed. You may go on pilgrimage tours. Some may wander here and there. Ketu’s aspect may affect the health of your mother. Some of you will have to spend more for repairing your house, vehicles, etc. you may also have unwanted quarrels with others .you may meet with accidents. You cannot concentrate on your business. You will lose peace of mind. You cannot earn anything. Marriages proposed in your family will be delayed. You may get loans for meeting your expenditures and the loans will trouble you. Misunderstandings may develop with your parents. They may leave you and you will have to worry for it. Some of your relatives may also leave you. Your friends will also leave you. All your friends and relatives will become your enemies. Relationship with your spouse will be good but you have to maintain it very carefully. You should talk carefully with your spouse because even some casual talk may bring separation. New friendship may bring trouble. You cannot expect your relatives to help you. Problems will arise in your ancestral properties. Be careful with your new friends. Now, on 27.7.17, Ragu transits to Kadaga Rasi and Ketu transits to your Jenma Rasi. Due to the transit of Ragu in the 7th house, marriage proposals may suffer some setbacks or they may be delayed. You should take extra care in the health of your spouse. Your spouse may have to suffer due to blood related deceases, poison related deceases and allergy. You will have the friendship of characterless women and their friendship, by giving importance to petty matters. Relationship between the husband and wife will not be so good. At the same time, your mental strength will increase. You will have the courage of facing any sort of difficulties. But you will have confusion at the time of taking a decision. You will have new friends. Among those friends, other-religion people will come to your help. But you should be very careful and should have a deep thought before joining them with you in your business. At the same time when new friends come to you, some of your old friends will leave you. All your financial problems will go away and your speech will bring success. Your talented conversation with others will attract them and bring success as expected by you. Your necessities and your requirements will be fulfilled. All the domestic requirements will be fulfilled. You will please your family members, giving them new clothes and ornaments. You will welcome your relatives and friends and treat them well .they will love you. You will have unnecessary expenditures for your vehicles. You will have misunderstandings with your brothers and sisters. Those who are in public life should be extra careful, because you will be severely criticized by others and suffer disrespect. Ragu will give unexpected income in abundance but at one stage he will take back everything. So, always ensure care and safety measures. Ketu transits in your Jenma Rasi and his transit will increase your name, fame, talent, skill and what not. Your social status and popularity will improve. You will evince interest in the spiritual activities. Some may develop interest in the arts of astrology, hypnotism etc., if Ragu-Ketu Dhasa Bukthis are running in your horoscope. You should never resort to ulterior motives. You will learn Astrology and other arts for the sake of learning. If you adopt truth and honesty, you will gain popularity, name and fame. You can read the minds of others. Your name and fame will be shared by your spouse. You will have a cordial life with your counterpart. You can start new business or an institute in the name of your wife/husband. You will get assistance from your brothers and sisters. Some will get jobs abroad. Some will have problems due to shortage of money. You may lose your honesty in the money matters. You should avoid signing as surety to others. The behavior of your children will worry you. Your mind will always be worrying for any matter. . You will have unnecessary fears in your mind. You will have thoughts which are not necessary for the situation. You should take care of your health. You will have heat related deceases. You may have boils, injuries allergy and skin deceases. You will have some setbacks in your business and thereby develop mental worries. Students, however intelligent they may be, there may be chances in getting diversion from your studies. Your talent may not help you now. You should be careful in all the matters. You should also be careful while dealing with electricity, weapons and poison. There are also chances of losing your mental strength. Care is required in all the matters. Ragu transits to Kadaga Rasi i.e. to your 6th house and Ketu transits to Mahara Rasi i.e. to the 12th house, on 20.6.2014. Ragu aspects your 8th house by his 3rd aspect and your 4th house by his 11th aspect. Ketu saspects your 2nd house by his 3rd aspect and your 10th house by his 11th aspect. By the transit of Ragu, those who are searching for jobs will get suitable jobs. Your business will flourish. You will get expected income from the expected source. Some will wind up their old loans. Your enemies and competitors will be weakened. Problems created by them will vanish. Diseases if any troubling you will be cured. But some will suffer from problems like indigestion, gastric troubles stomach problems. Women will get uterus troubles. You may also face enmity from your close relatives and friends. You will get unexpected income. Some will get some unexpected fortunes. They will give some facilities which will only be temporary and not permanent. Those who are suffering from court cases will get relief from them. Some will get favorable judgments. Some will start new business. Those who are working in the offices will get promotions and new responsibilities. Your intelligence will rise up and will bring success in all your efforts. You will cross all the hurdles in your way successfully. You will have to undergo travels often and your travels will be profitable. Ketu, by his transit in your 12th house, will give favorable effects. All the unnecessary expenditures will come down. Unexpected income will come to you. Ragu and Ketu transit to Kadaga Rasi and Mahara Rasi respectively on 27.7.17. Ragu transits in Kadaga Rasi i.e. to your 5th house and Ketu transits in Mahara Rasi i.e. to your 11th house. The transit of Ragu in the 5th house develops various kinds of imaginary thoughts within you. Your mind will have many thoughts for doing many bravery deeds without thinking as to whether you can do it or not. You will have a desire to acquire all those things you want to acquire. Some will develop many new ideas and new ways and means for changing thoughts into actions. Some will buy new vehicles and new machines required for their business. Those who are working in the offices, will have unexpected transfers, change of jobs and promotions having new responsibilities. Children of some of you will have some setbacks in their promotional activities. Their attitude towards you will not be good and you will have mental worries by them. During this period you should move with others very carefully irrespective of the fact whether they are elder or younger, because unnecessary problems will come from them to you. Some will get unexpected job-opportunities . Some will start business in a different way. Ketu’s transit in the 11th house will give you unexpected income. You will flourish in your business. Some will enter into new kinds of businesses. Income will be good and all of your business dealings will be good. You will have the friendship of good persons and new friends. All the news heard by you will be good and give happiness to you. You will have meetings with saints and sages. Your financial status will improve. Your elder brothers will help you. Your elder brothers will improve their status. You will get new Govt. jobs. Those who are working in the offices will get the support of their higher authorities and will earn a good name from them. Some will get promotions and transfers to the desired places. Some will get help from the politicians and from the Govt. offices. During this period, your mother’s health will go down. Your father’s health also will not be good. You will get favorable judgments in the court cases. They will come to an end. Your efforts will bring success in all the matters. Some will get jobs abroad. Some will go on foreign tours. You will get sizeable income from the foreign trades. During this time you will get happy news from all corners. Your talent and glory which was hidden so far will now be known to all. Some will be benefited by the vehicles. You will succeed in all of your efforts. Some will have a child-birth. You will have to undergo excessive travels and the travels will bring favors to you. You will buy jewels and valuables. You will have cordial relationship with your spouse. Your relatives will be helpful.